The stenciling process can vary greatly, depending on the type of stencil used (see Paper or Plastic? ), whether the stencils are applied directly to existing concrete or to an overlay, and the decorative effects you are trying to achieve. Creating an embossed pattern by troweling or spraying a thin concrete overlay or skim coating over the stencil. Etching designs into the concrete by lightly sandblasting or using a gelled acid that won’t seep beneath the stencils (see Gels and Thickeners Give You More Control). 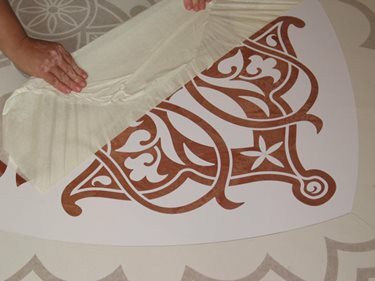 With all these techniques, you’ll usually achieve better results by using a stencil with an adhesive backing that prevents movement. For more information about using adhesive-backed stencils to enhance concrete floors, see A New Way to Stencil Concrete. Spray-down overlays work great with paper or plastic stencils, permitting the creation of intricate borders, custom designs, and logos. You can even make your own stencils by simply cutting Masonite or thin plywood with a jigsaw into a design. Whatever stencil material you use, make sure it’s thick enough that it won’t tear during removal. Apply the stencil to a base layer of the overlay material, then spray apply the texture coat in a contrasting color. If you plan to apply stain accents to the overlay, it’s often easier to do the staining before removing the stencil so the color underneath is not affected. When spraying the topping over the stencil, it’s important to spray straight down to help prevent stencil movement and to keep any overspray from bleeding underneath the stencil and blurring the pattern lines. 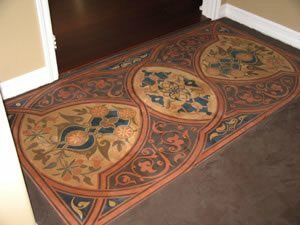 Because microtoppings are applied so thinly, they are ideal for use with adhesive-backed stencils to create decorative floor borders and other designs. After surface preparation has been completed, the base coat is troweled or squeegeed down to the width of the stencil. The stencil is then adhered to the tacky base coat. Repeat this process until the entire stencil is laid. You can then trowel a thin topcoat over the stencil (approximately 1/8 inch). When creating stenciled borders, a small paint roller is a great way to apply a microtopping because it provides complete coverage without dislodging the stencil. When using stencils with thin overlays, it’s usually safe to remove the stencil after several hours. A simple check for determining if the stencil is ready for removal is to gently lift a corner from the surface. If the material that has accumulated on top of the stencil flakes off, then the stencil is ready to come up. If the material adheres to the stencil, leave it in place a bit longer. Do not leave the stencil in place overnight. As the overlay hardens, it will lock down the stencil and make it difficult to remove and cause the edges of the pattern to ravel. 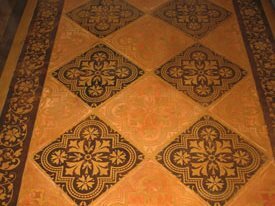 See how stencils can be used to add a custom design element to concrete flooring. Learn the process for applying a stencil to concrete floors and get tips on properly using stencils. Watch how an adhesive-backed stencil is applied and how acid-etching gel is used to reveal the pattern.